As we zoom in further, you can start to see that it’s not truly a uniform grey buttercream frosting, but rather a grainy sort of mixture. Finally, when you zoom in far enough, you can see what we’re really looking at: untold millions* of shiny little balls of solder. Yes, shiny. 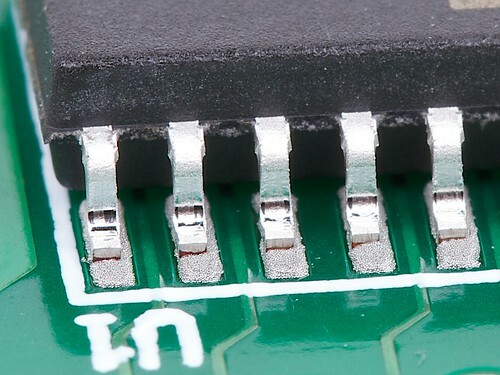 When you really get down to it, the tiny bits of solder there really do look like the regular wire solder that you might use at your workbench. Only, they’re neatly round, and suspended in a liquid solder flux. 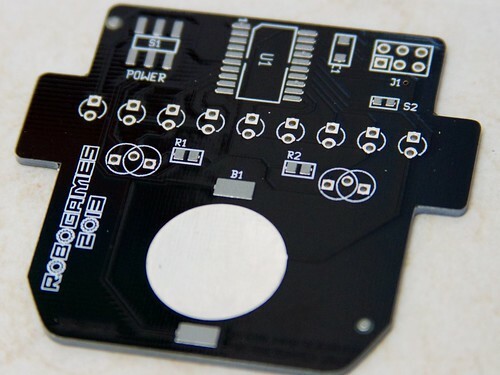 After stenciling and placing the components, the circuit boards will be baked in a reflow oven until all those solder balls melt and fuse together, becoming roughly indistinguishable from solder that started out in a wire. This is “type 3? solder, which allows solder balls of up to 45 ?m in size, where 99% of those particles are below 38 ?m. 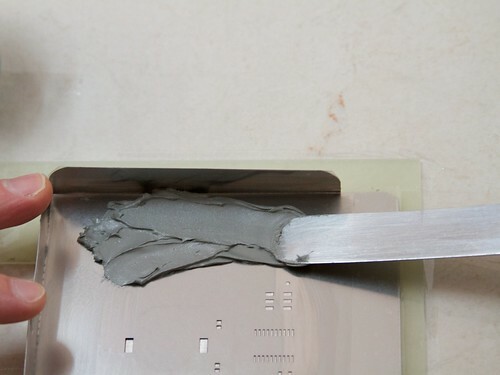 This is a good type of paste for basic surface mount work (the kind where you can still see the leads) but finer-mesh solder is needed for working with finer-pitch electronic components. 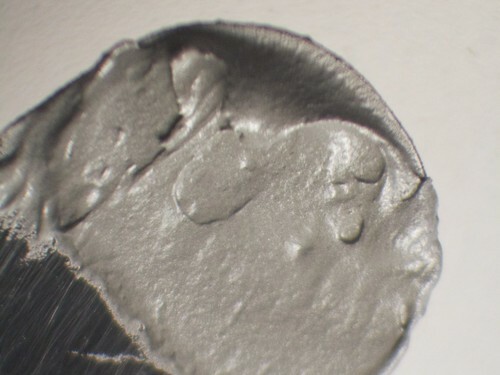 *The weight of a 38 ?m solder ball is somewhere around 210 ng, so given that 90% of the weight of solder paste is from the metal (not the flux), we’re looking at roughly a billion solder balls per 250 g tub, to give an order-of-magnitude estimate. So what about back on the circuit board? 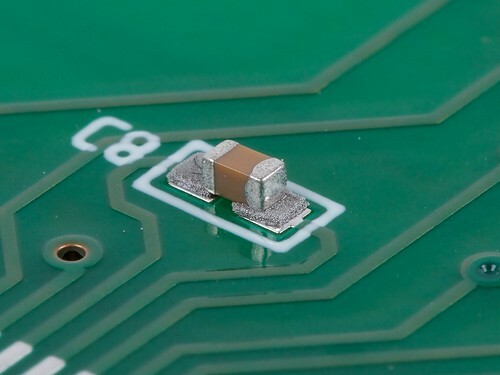 Sometimes, if you know what to look for, you’ll see the little solder balls, particularly if you’re inspecting a board under the microscope before reflow. You can just make out the solder balls in this photo. You can also see the thickness of the stenciled paste, which was laid down with the help of a 4-mil laser-cut stainless steel stencil. The little ceramic chip capacitor there is 0603-sized (60 mils by 30 mils) for scale. 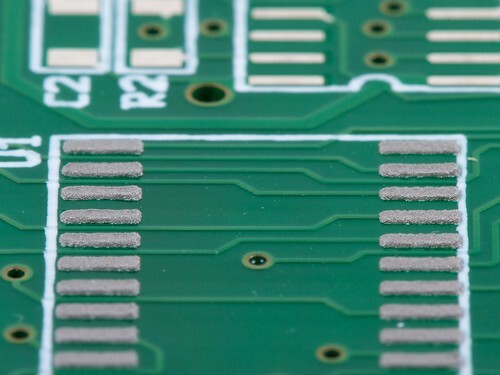 Even in larger areas of the circuit board, paste is still three-dimensional. 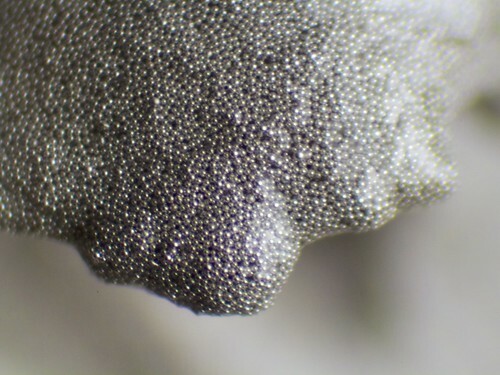 From the side, under a microscope (or sufficiently good macro lens), you’ll see little piles of solder balls, not just a 2D uniform grey. A little final perspective: you can see how big the solder balls are here at the corner of an ATtiny2313A-SU microcontroller, which has an SOIC-20 package with 50 mil pitch. The legs press into the sticky paste, holding the chip in place until reflow. Wow, such clean shots. What microscope are you using? 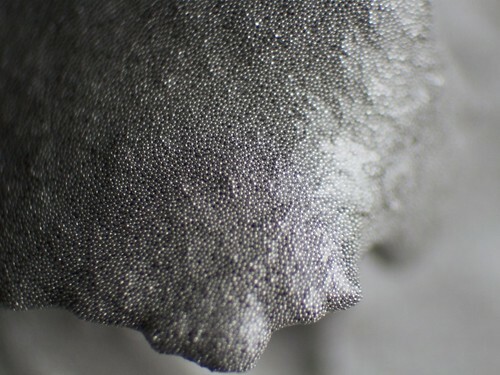 Small, uniform particle size and low-ish melting temperature… Any way of using this as a 3D printing material? Cool stuff. I just looked up μm : .001 of a millimeter. i.e. 22-26 balls side-by- side per millimeter. Absolutely stunning shots, and a cool new perspective on something we all take for granted! From now on I’m going to imagine all my electronic equipment being held together by millions of tiny Buckyballs! Very nice pics. 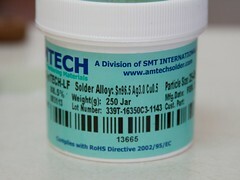 What happens to solder paste when it expires? does it taste funny? Do the balls go flat? I assume the paste rather gets runny and doesn’t hold the solder in place or it gets thick and won’t spread evenly. I’ve heard of it expiring, but never knew how. I’ve had a tube of flux for 20 years now. When it gets too thick, I put in a couple drops of alcohol and it seems to work good as new. Wondering the same thing. What can go bad? 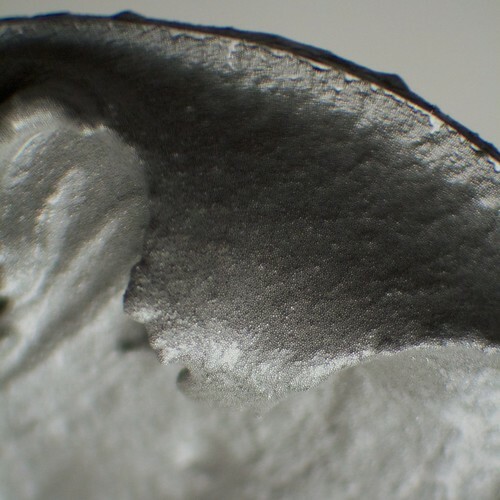 Why doesn’t normal flux core solder have a shelf life? Though I don’t have any I heard you can also mix it some liquid flux. You have beautiful pictures. I would be interested to see further steps in the reflow process as you image them with your high production values. 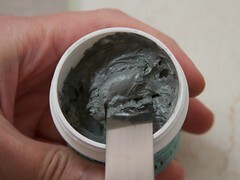 Thanks for this — it was enlightening to consider the composition of the paste. I’ve always heard that surface mount is horribly difficult to do, but this sounds like you’re essentially painting and baking. Very twitchy, small painting, mind you, but surely it’s not impossible for the hobbyist? No, not impossible, nor quite as easy as through-hole assembly. See our earlier article (linked above) about the RoboGames medals to get an idea of the methodology. Interesting read, thanks. I can see how some people prefer through-hole soldering. Thanks Windell – it’s great to see so many blog posts these days and these “basics” ones are always excellent! Looks like you are using a commercial stainless stencil for your paste – have you ever tried laser-cutting them in, say, thin acrylic or polycarbonate for small batches? I have wondered whether commercial laser-cutting services might be cheaper for the hobbyest that commercial stencils.